My sister is one of those people that whatever she touches turns into a masterpiece. A while back she took a class and made this wonderful bust. The model was in her 20’s and wanted to have this particular piece…UNTIL it was fired and it slumped a wee bit. Whoa! She didn’t want that! It looked so OLD! So my sister carted it home where I later admired it, and it came to live in my garden. Well…let’s just say it found someone who could truly appreciate it exactly as it is. It brings me great joy to have a piece of my sister’s work – my own Venus of Willendorf, my Aphrodite – protecting and watching over the garden. The two of us have conjured up some great plans for this season. Enjoy more Share the Joy Thursdays by visiting Mari @ http://meriak.blogspot.com/. ~ by Dawn Elliott on April 28, 2011. It’s really a great piece of work. There isn’t anything wrong with a little “slump,” as you say. 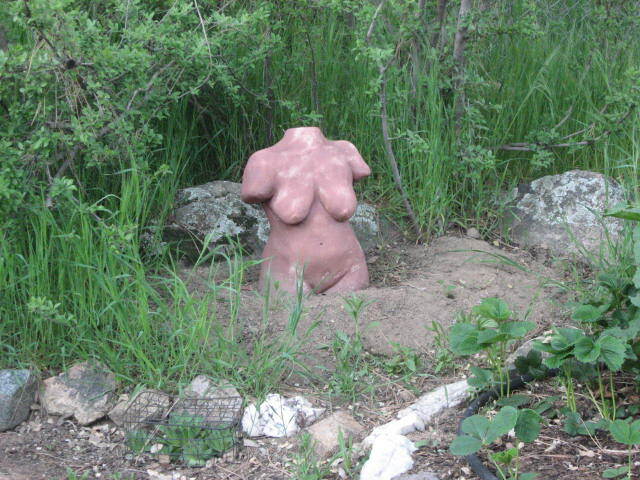 I’d love to have this bust in my garden, truly a masterpiece! Thx for sharing. Have a great day.